Hi, Sheila, where is the example fig TBD although it is very simple? My bad, it's been hard to prioritize the figures, but hopefully we can get to them in the near future. I have a few questions on haplotype caller. First, I don't understand where to get the output of candidate haplotypes. How do you generate the table that is talked about in 1? 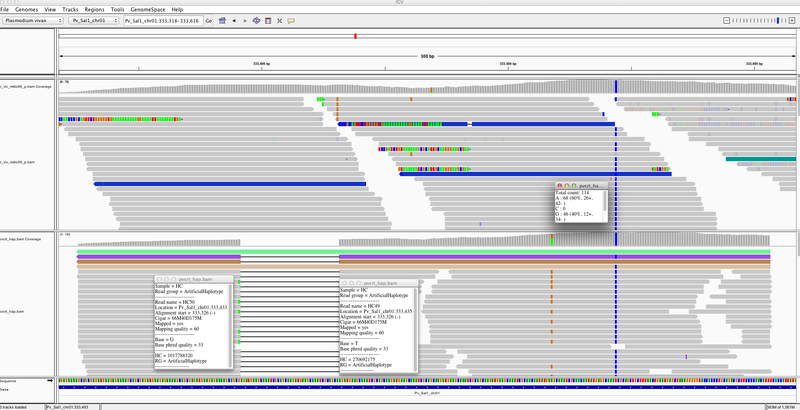 The attached screen shot shows an original bam for one sample and then the output for that region after using haplotype caller with several samples together. I don't understand why four haplotypes (denoted by the shaded reads I colored using Tag=HC) are present when there are only two unique cigar strings (the boxes show two of the strings). What does Read name= HC49 mean? Is this the haplotype? Are there 49 different haplotypes? Also the heterozygous SNV at 333,518 is not emitted in the vcf file. Shouldn't it be? The table of candidate haplotypes is not output from GATK. However, you can see the candidate haplotypes that were considered in the bamout file. The candidate haplotypes are labeled as Artificial Haplotypes. It is odd that position 333,518 is not in the vcf. Can you check and make sure all the base quality scores and mapping quality scores are high? This could be related to another bug that is waiting to be fixed. The artificial haplotypes are output in both the forward and reverse orientations. So, the two same artificial haplotypes are not simply a quirk of Haplotype Caller. I read a lot about this topic but I didn't find an exhaustive answer about my doubts. I'm working on a target panel and I don't understand exactly how GATK (v.3.7) select reads to calculate genotype sample. I can clearly see that some reads have alignments problem, like flagged 401 (MQ=1) and 161 (not proper mapped read), and GATK filter out them, but what about M03943:73:000000000-AV81U:1:2104:9715:10639 and 1:1113:3640:17203 (chimeric reads) ? It depends, maybe, on Q-score (even if Q-score is greather than 30 for this position) or Alignment Score 'AS' ? Is there any detailed documentation on this argument? Thank you very much for your help, have a nice day! You can use --emitDroppedReads to check out why the reads have been dropped. However, even with -edr, bamout has always 106 DP. Can you explain me why I see a total of 241 reads? Does it include artificial reads and Duplicate reads? Although, --emitDroppedReads will have no effect on the Depth that is output. That is simply to show you where some of the unused reads went/why they were filtered. But I still continue to not understand why these reads have been filtered. Am I looking to -edr results in a proper way? I think the 241 reads are the reads that span the entire active region, not just that site. As for why the 11 reads are being filtered out, can you confirm that all 115 reads have high base quality (greater than 10) and high mapping quality (greater than 20)? Also, to confirm, in the bamout you see 115 reads at the site of interest and only two are artificial haplotypes? If all of this is true, I may need you to submit a bug report. No, in the bamout I see only 106 reads, 2 of them are artificial haplotypes. I see 115 reads only in bam file used for variant calling. The only thing that seems to be strange in previous reads is CIGAR string, with Soft clipped bases, but I can confirm that I didn't use --dontUseSoftClippedBases command. Just to be sure, does HC use any filter based on edit distance or alignment score? Yes, that is correct HaplotypeCaller does not use any filter based on edit distance or alignment score. The internal filtering in HaplotypeCaller is complicated. Different filtering is done at different stages. Right now, it is not possible to get perfect accounting for every single read in GATK3. However, this has been reimplemented in a more straightforward way in GATK4. For now, in GATK3 HaplotypeCaller those minor differences are just a limitation of the tool.